Cavalry Scouts fire an AT-4 rocket at Krivolak Training Area. Credit: Sgt. Casey Hustin. The Army of the Republic of Macedonia (ARM) has hosted aerial and ground gunnery training by two units under the command of the US Army Europe at the Krivolak Training Area (KTA). 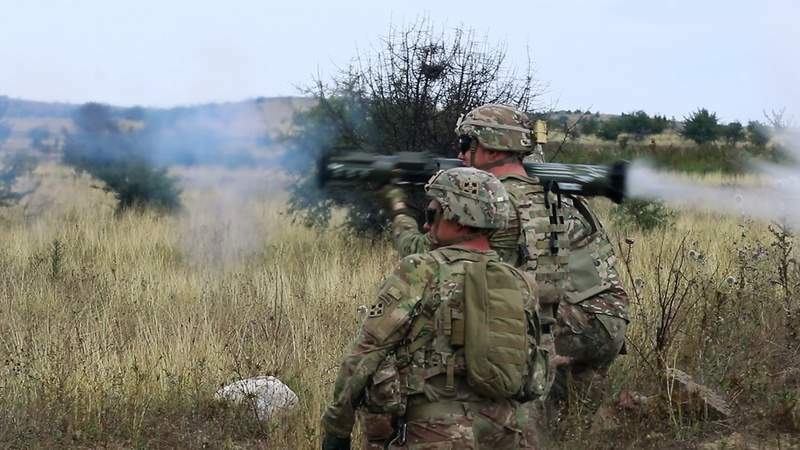 The training involved the participation of more than 100 soldiers with the 3rd Squadron, 61st Cavalry Regiment, 1st Brigade, 4th Infantry Division, (3-61 CAV) based in Fort Carson, Colorado, and more than 20 soldiers with the 3rd Battalion, 126th Aviation Regiment, (3-126 AVN) of the Massachusetts Army National Guard in Boston, Massachusetts. 3-61 CAV operations officer major Isaac Howard said: “KTA absolutely contributes to the training’s effectiveness because of the breadth of activities that units may conduct. According to Office of Defense Cooperation US Embassy, Skopje, Macedonia bilateral affairs officer captain Patrick E. Enriquez, the 3-61 CAV and 3-126 AVN are the first US Army units to carry out gunnery on this scale at Krivolak. The aerial and ground gunnery training is slated to conclude in late August this year.